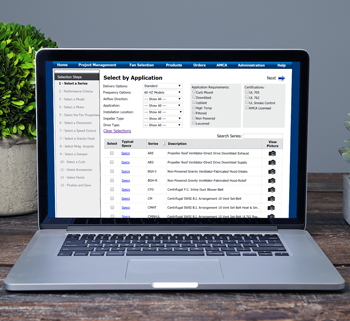 Fan Selection Software | S&P Canada Ventilation Products, Inc.
Optisizer is a state-of-the-art fan selection program designed by Soler & Palau Ventilation Group: North American Division to help industry professionals choose the most suitable product for every application. 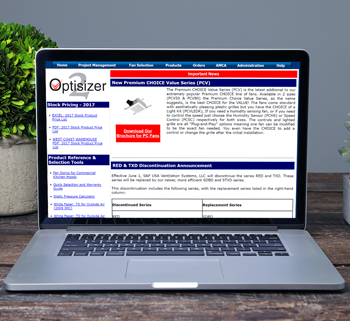 Optisizer allows you to obtain product information, submittal drawings, fan performance details and specifications. With Optisizer you can follow a project from the initial fan selection, through the bidding and submittal phases, after which you can place an order from the program. As an online based program, you can complete your fan projects from anywhere in the world. Whether at your desk or over 2,000 miles away, as long as you have access to the Internet your projects are available from any-where and at any-time. You can also share your projects with coworkers if you need to collaborate. This completely web-based program ensures you have the most up-to-date product information and pricing. There is no need to download updates or always use the same computer. Optisizer is available wherever you are. Optisizer's intuitive selection wizard guides you through the fan selection process. Fan and option compatibility rules are programmed into Optisizer so every selection you make is correct. 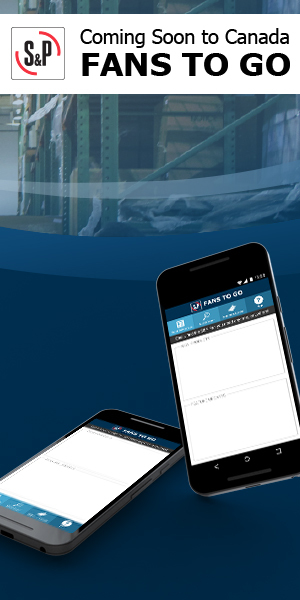 The program will not allow incompatible options, minimizing errors in your quoting and order entry process. All you need to know is your volume and static pressure and Optisizer will return the best fan models for your criteria. Plus the easy to read grid allows you to select the model based on size, horsepower, price, sound level, efficiency and more. Please email custserv.ca@solerpalau.com if you would like access to the program or if you are interested in training.